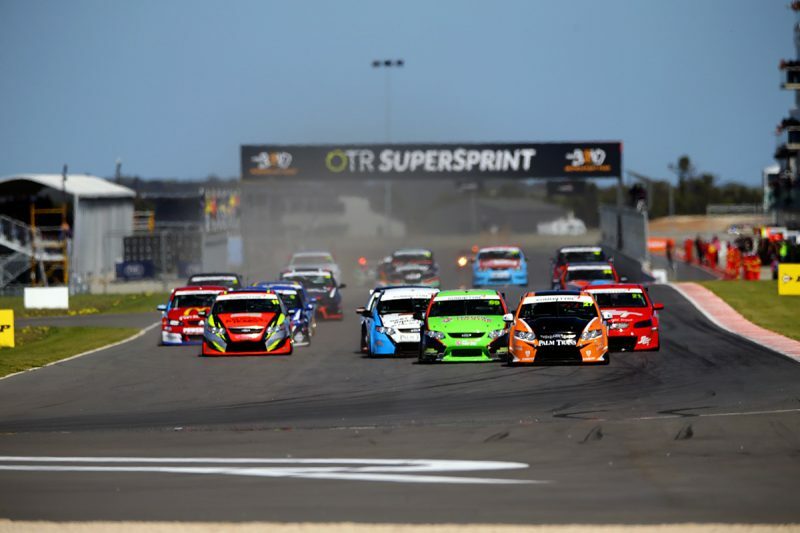 Tyler Everingham has increased his points lead by winning Race 1 of the final round of this year’s Kumho Tyre Australian V8 Touring Car Series at The Bend Motorsport Park. The MW Motorsport driver was over a second ahead when the Safety Car was called before the first lap was out due to Mark Primmer (#41 Dial Before You Dig BF Falcon). He was nearly two seconds to the good at the end of the restart lap and went on to win by nearly four seconds in the #27 FG Falcon. Jack Smith (#21 Brad Jones Racing VEII Commodore) was fourth out of the first corner but picked off Zak Best (#78 MW Motorsport FG Falcon) at the start of Lap 5. Both were handed another position when Jon McCorkindale (#69 Dial Before You Dig FG Falcon) ran off at Turn 13 while in second place, and Smith went on to finish runner-up. Best finished third, giving up six points to team-mate Everingham in the title race over the course of the day having qualified on pole. McCorkindale took fourth and Harley Haber (#99 Image Racing FG Falcon) fifth, the latter having driven from the very back of the 18-car field after a red flag meant he did not have a chance to set a representative qualifying time. The title will be decided over two more races tomorrow at 1015 local time/1045 AEST and 1555 local time/1625 AEST. 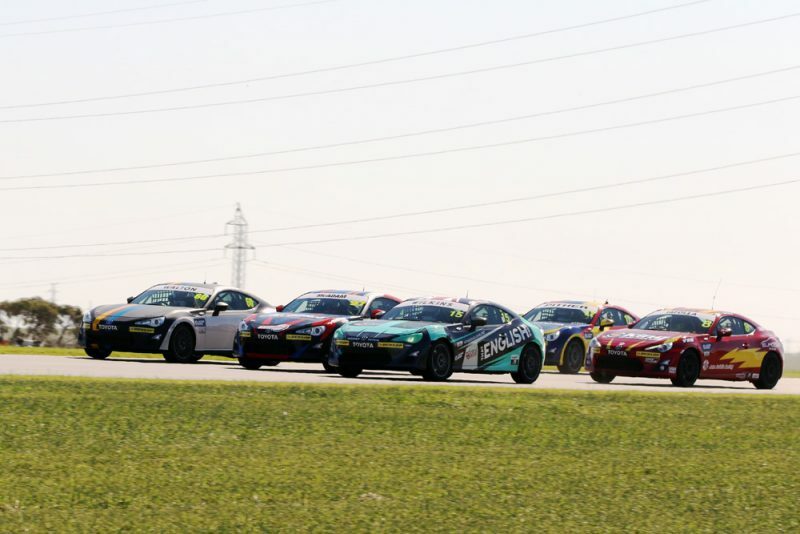 James Wilkins won a thrilling Toyota 86 Racing Series race, seeing off a host of challengers throughout the seven lap encounter. A tight group saw frequent changes for the lead until Wilkins and Chris Pither eked out a small advantage in the final laps. Cameron Crick too remained in contact while early leader Cam Walton took a quick tour through the grass en route to fifth behind John Iafolla. The action at the front was frenetic, with another intense battle breaking out among those running towards the bottom end of the top 10. There was contact for Declan Fraser that left him in seventh while Jason Bright raced to 11th having qualified 20th. Race 2 was equally energised, Nic Carroll taking the win ahead of Walton and Fraser. Carroll headed the race throughout, with Walton climbing from third at the end of the opening lap while Iafolla dropped from second with two laps in the books. Having finished second in the morning’s race, Pither dropped to 13th, one spot back from Bright. The final Toyota 86 race of the weekend is scheduled for 1200 on Sunday. Hunter McElrea won the opening Australian Formula Ford race of the weekend, edging out Cody Donald to the chequered flag. Starting second, McElrea took the lead from Hamish Ribarits midway around Turn 6 before the Safety Car was deployed for a clash between Paul Zsidy and Sam Dicker. At the restart, McElrea headed a four-way battle for the lead before he and Donald opened a small advantage. They then ran nose to tail to the finish, McElrea propping on the final corner to prevent Donald gaining a run to the flag. 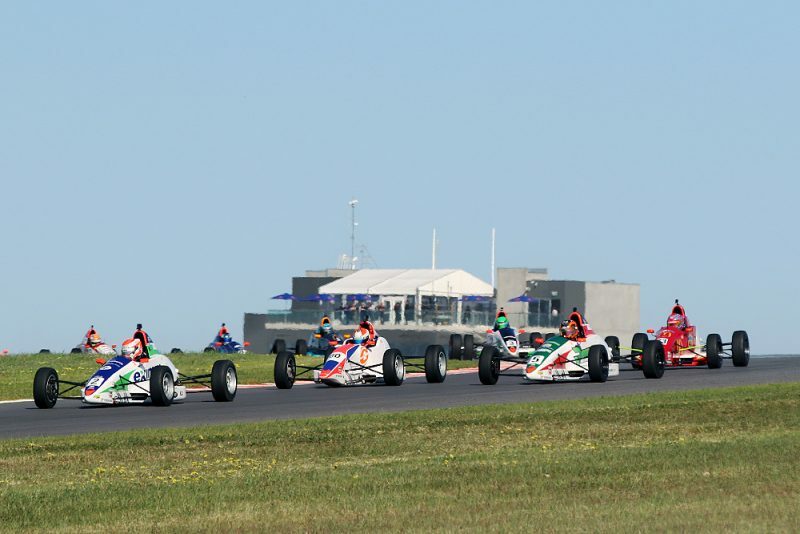 Ribarits rounded out the podium in the category’s only Saturday session, with Formula Ford on track next for Race 2 at 1130 on Sunday morning. 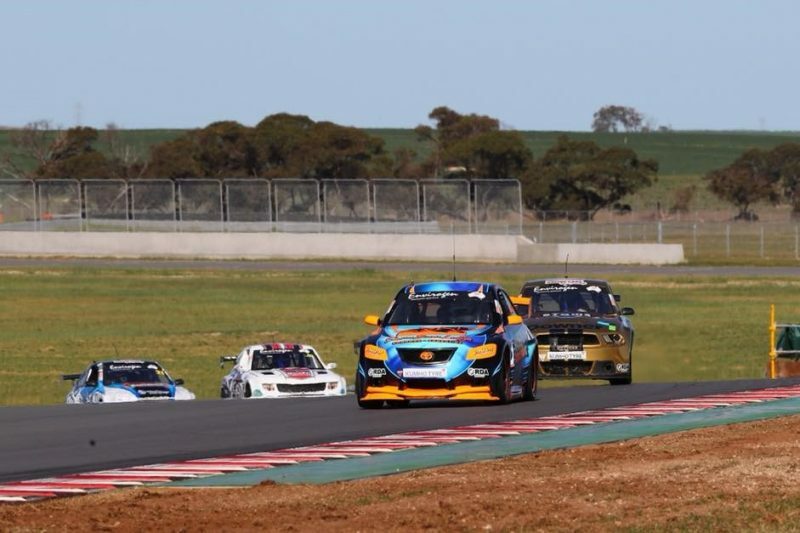 Joel Heinrich is now two wins from two race starts in his home state this weekend despite dropping as low as fifth in Race 2 of Aussie Racing Cars. Justin Ruggier led the field away as a result of Heinrich’s poor start, while Daniel Price spun spectacularly out of second position when the rear of his car stepped out at Turn 10. That moment gave one position to Heinrich and he was back up to second by the end of the lap before passing Ruggier at Turn 17 on Lap 2. An apparent coming-together between Pawel Faber and Davis Makin brought out the Safety Car on Lap 4 and set up a one-lap dash to the chequered flag. Heinrich quickly skipped clear from Ruggier, and Ruggier from the rest on his way to a runner-up finish, but Kel Treseder faced a battle with Blake Sciberras for third. Scibberas briefly took the position but Treseder squeezed back past turn Turn 14/Turn 15 and went on to take third. Charlotte Poynting and Jonathon Webb took the start, the latter in a spare car, after their big collision in Race 1. They finished 18th and 20th respectively in the 26-car field. Two more seven-lap races follow tomorrow at 0915 and 1525 local time.